The skeleton in the ‘hoard site’ (now officially ‘Site 2’) was lifted in December and January by Professor John Hunter and his forensic team. They were able to identify the remains as those of a large adult man, aged between 25 and 35. Many of his bones were missing and those that were left were scattered in a way that suggested that he had been laid out, left to drop to pieces and then his bones disturbed, before the pit he was in was backfilled. Possibly the pit had been roofed, and that had collapsed. One of our aims this season is to explore the possibility that there was a passage into the pit/chamber, which would make it similar to other neolithic burials in the Cotswold/Severn valley area. The bones are now with specialists at Bradford University, who will, we hope, be able to tell us more about this individual, especially the date, his health, and whether he was local or came from elsewhere. 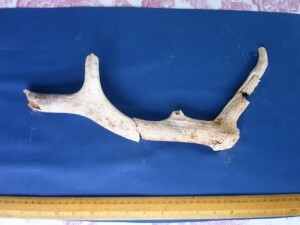 At present we think he dates to the neolithic period (roughly 4,000 to 2,000 BC), based on the polished flint axe and antler pick found in the fill of the pit. It is possible that he is very late neolithic, and the early bronze age beaker (C2,200 – 1,800BC) buried in the top fill of the pit is contemporary. We need dates from the charcoal in the beaker deposit and from the bones of the burial to sort this out. Archaeology Warwickshire put us in touch with an environmental specialist,Kelly, who took samples in May from the two ditches and the possible bank material in the long trench (now officially ‘Site 3’), and she will analyse these at Birmingham University for pollen and what this can tell us about the iron age and Roman surroundings of the site. Now that these samples have been taken we have been able to remove the shoring from the deep ditch, prior to backfilling. The first dig day of this season was spent cleaning Site 2 in the area where there might be a passage into the pit. 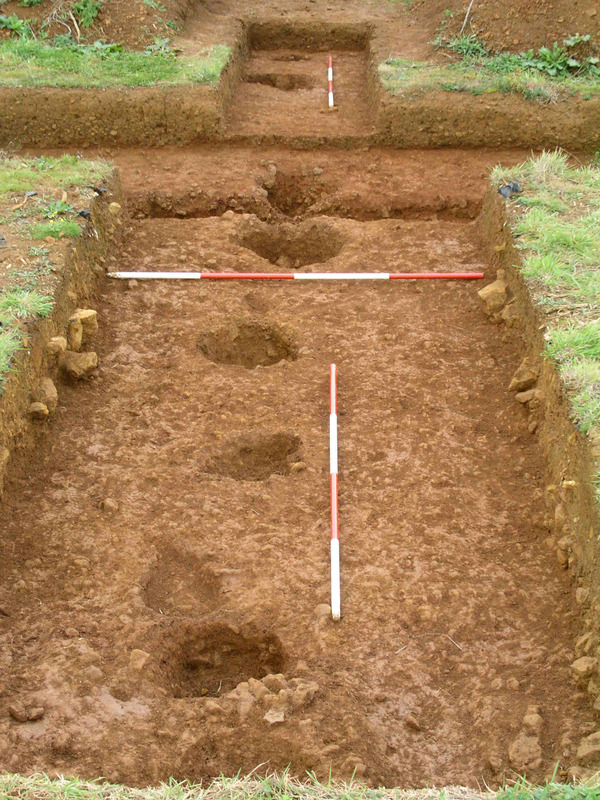 A small extension to Site 3 (opened to search for possible postholes of a revetment) was completely de-turfed and further excavation of the Site 3 extension has revealed a small patch of large stones under the plough-soil level. In Site 2 further investigations revealed hints of a passage, or possibly an area of the grave pit incompletely excavated last year. 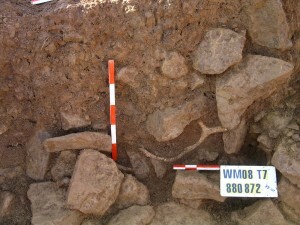 The tell-tale signs of disturbed ground – calcium carbonate deposits on stone, loose rubble and burnt stones – were confirmed by a small patch of bone in amongst the fill. We are hoping for more settled weather so that we can crack on with finding the north passage, the missing postholes, and we can start back on Site 1 nearer the church, where there is a fourth building to explore. Site 1, nearest the church now seems to contain four Roman period buildings, one succeeding another over time. The order of construction seems to be Building 1, Building 4, Building 2 and finally Building 3. Building 1 is aligned with the field system in the field to the east, the other 3 are all on a different alignment. Each building seems to have been a different size, shape and construction, probably reflecting their different functions, changing over time. None is domestic in character. 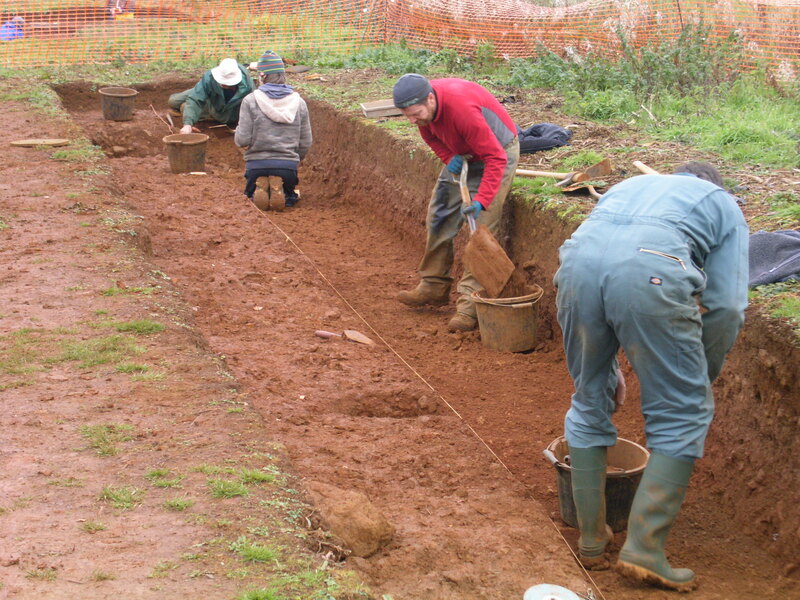 Building 1 may have been aisled, a typical Romano-British rural type, and was probably a store of some sort. Building 2 was a timber-framed construction built on stone sleeper walls, one part has a furnace in it. Given that the ditch terminal at the south east corner of our area was full of iron-smithing slag and charcoal it is possible that part of this building was a smithy. The problem here is that we have found no slag associated with the furnace – yet. Building 3 is the latest in the sequence but the first to be excavated; it is the biggest, stone built to the eaves, and probably some sort of store. There was a path about a metre wide along its south western wall and a patch of stone and gravel inside the same wall that may mark the location of a door. It seems to have had parallel ditches on the south west and on the north east. We still don’t know how the gable ends were formed, nor even where they were. 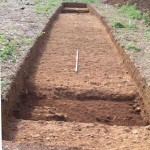 Building 4 is so far only represented by a short stub of foundations at the north east edge of the site. It lies directly under Building 2. These buildings probably span a considerable part of the 400 years of the Romano-British period. The change of alignment between Building 1 and the rest may represent a more general effect seen elsewhere in Britain in the 2nd century AD and probably reflects a general change in agricultural practice. There was a domestic establishment in the vicinity (to the east? ), as we have found spindle whorls, a quern fragment, cooking debris, knives and food bones, as well as pottery in large chunks, bigger than would be expected from manuring activities. The site is not ideal for a farm, however, as it is on top of the hill, and a deep well would be needed, when there are springs just down the hill above Warmington. At present we think that we have a specialist rural site, possibly a collection/distribution point with access to an all-weather track along the crest of the Cotswolds? Last week we concentrated on tracing the south eastern wall of Building 2, we need a decent section across it. More to do there, as it appears that there are more pits confusing the stratigraphy. We also cleaned up the long sections across the site, and recorded the ditch/gully in the south west extension, parallel with Building 3. 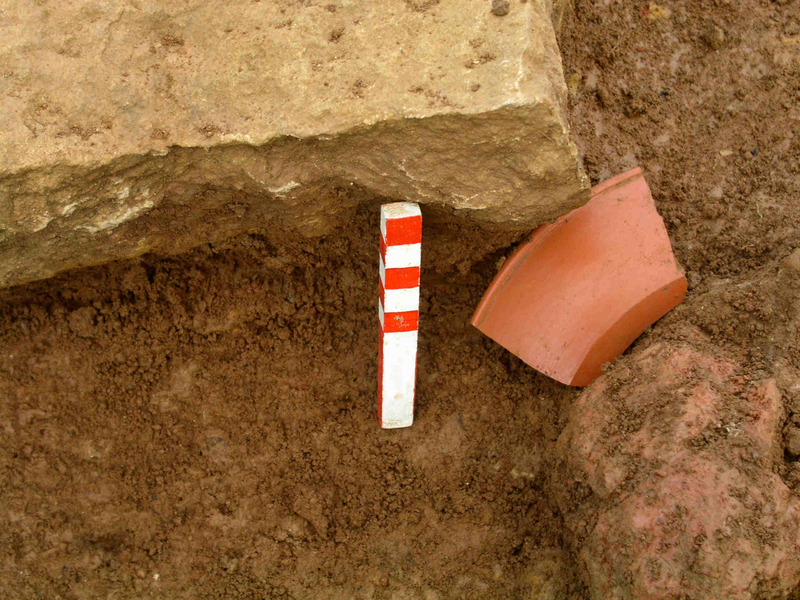 This showed that it was dug into an extensive reddish clayey layer which contains Roman period pottery. This layer is now visible across much of the site, and it probably represents an agricultural landscape dating from before the buildings were erected. We have also shown that the furnace in Building 2 has at least two courses of stone, and that it was filled in with flooring material when the building was refurbished. We need to get to the floor of the furnace, which we hope is formed of baked clay, so that the archaeomagnetic dating specialists can get a usable sample. The specialists at Bradford University have finished their initial study of the prehistoric human bones from Site 2 and have confirmed the preliminary identification made on site by the forensic team – the individual was a robust male and aged between 25-35. Their detailed report is currently being edited and should be ready soon. They have also started preparing the bone and teeth for isotope analyses and for the study of his childhood heath, as well as arranging for C14 dating. The cremations are still being studied, so no news there yet. The many reddened stones on the site are evidence of burning, and we would dearly love to know how hot they had to get to be so red. Cooking in my oven had no effect whatever. In the spirit of experimental archaeology we would like to hear from anybody with a pottery kiln who would be willing to allow us to “fire” some unburnt ironstone fragments at different temperatures for differing periods to compare the effects with our samples. If anybody with a kiln would like to participate in this experiment could they please email me. If you are concerned about the risk of explosions in your expensive equipment would drying the samples thoroughly, raising the temperature gradually and using a saggar prevent any damage? Hello. My name is James Lamb and I have been involved in an archaeological dig, at Warmington Herb Centre, for the past 8 months. 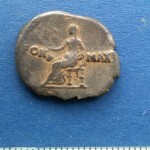 We were digging there because a few years ago, a Roman coin hoard was found. After some years Warmington Heritage Group got permission to dig at the site. 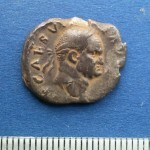 They started by excavating around the site of the coin hoard. They found an eight sided Roman building, which turned out to be a Roman temple. When they were digging the middle of the temple they found a big pit. 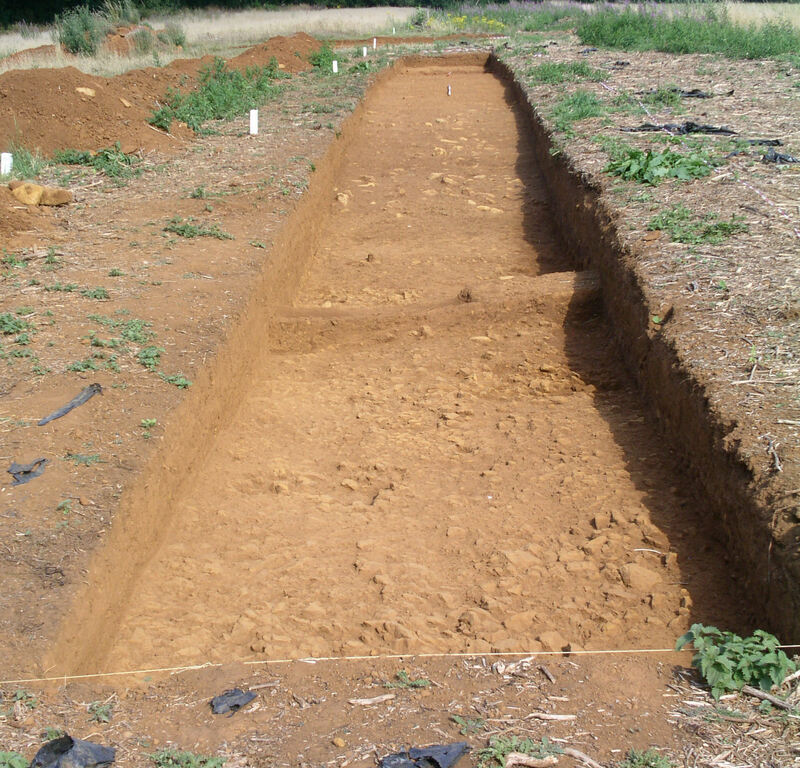 The lead archaeologist, David Freke, got very excited at the thought that there might be a burial there! A few months later, when they were digging down the pit, They found a stone axe head, unused! David naturally presumed that it was a grave good because there had been a beaker pot out of the pit before the axe head. But after a few weeks they found the remains of a Neolithic skull. Everyone was very excited about it, but left it to the specialist to get “Fred” up. After some Geophysics was done of the site, the group started looking at a few farm buildings in the opposite field, which dated to around 45AD, when the Romans had conquered Britain. 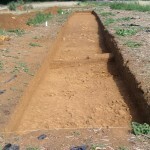 At the farm site there were three Roman buildings. Two of which were out buildings, like barns; and the third was a building for domestic use. 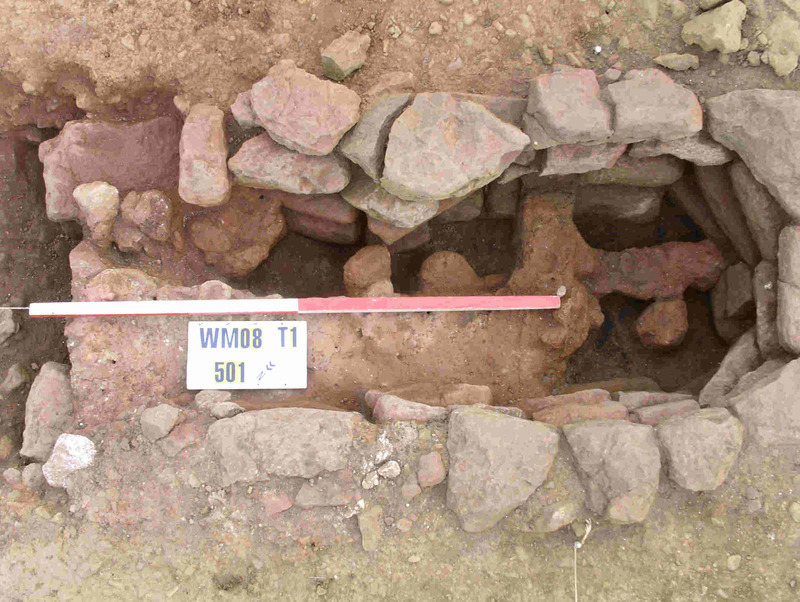 After a few years digging we have found, we think, a forth building; which is earlier than the others. But we have to wait till next year to find out! After the Geophysics were re-examined David saw a giant ditch and with a bank next to it, which is still visible in the ground today, running through the whole promontory. So we put in a 30 meter long trench to cover the bank and ditch. After a few weeks, we were looking for the bottom of the ditch and we thought it would be silt all the way down; but to our surprise, we found giant stones with deep crevasse in between them. After a few weeks all the stones were taken out and we were 3.5 meters down and 6.5 meters across; with shoring above us. All we had found at the bottom was a piglets jaw bone and lots of snails. 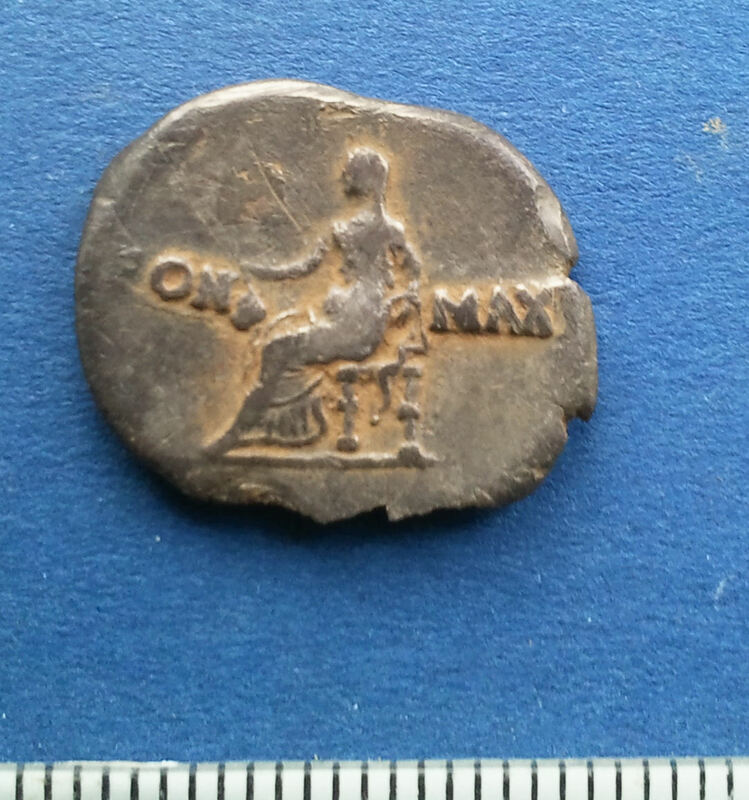 My favourite find, which I found, was a silver Roman coin, in the temple trench. 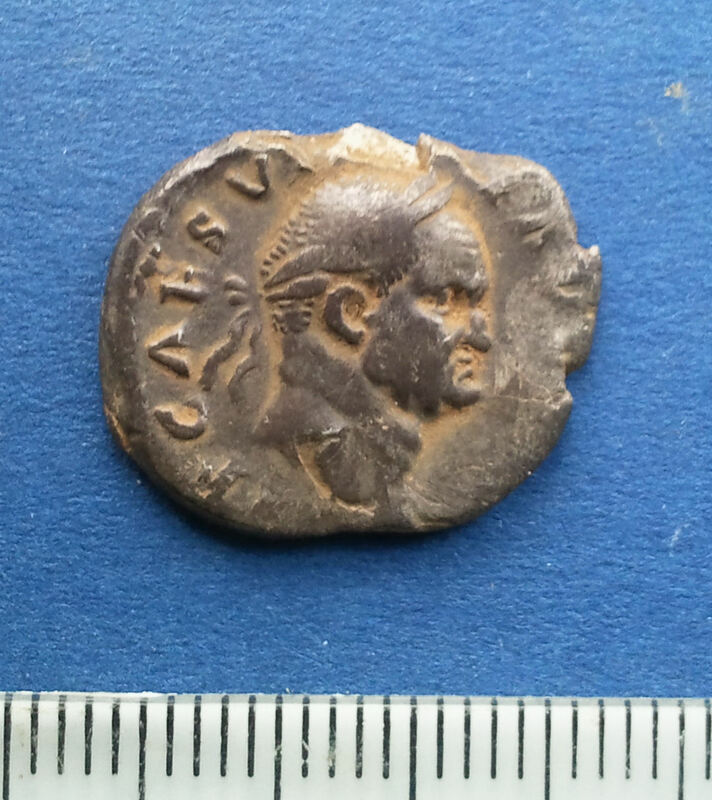 It was a silver denarius from the reign of Caligula, in 45AD. This is a plan of the trench nearest the Warmington church. The different colour dotted lines are the supposed walls of the buildings, and the solid ones are the walls found. As you can see there are, at least, 3 buildings. The blue one, we think, we are missing a wall at the top end, where we extended the trench to find it. The orange one, we have only found parts of walls, so we don’t really know what the building is like. But the green one is looking very promising. The only worry is that one of the walls has been robbed out, therefore quite hard to see where it went. On Thursday 19 December 2013 a group of specialists came from Wessex archaeology to dig the remains of “Fred”. They only started on digging up the remains when it was getting dark; but they did get the skull up, it was in many pieces. They had uncovered other pieces, like the pelvis and a rib. They are hoping to return to get the rest of him up! The team of forensic archaeologists led by Professor John Hunter returned for a further two days carefully cleaning, identifying and lifting the extremely fragile bones. Their expertise was necessary as some bones could not be lifted without crumbling away, even when consolidated, so identification in the field was critical. What emerged was a partial skeleton of a large adult man, whose remains were very disturbed, with some parts missing altogether. 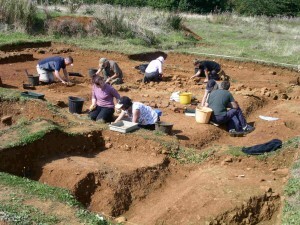 I will hopefully continue at the dig next year and hopefully find more fascinating artefacts! Further investigations of the south east wall of building two confirmed that it has been robbed of all but the few stones we knew about already. 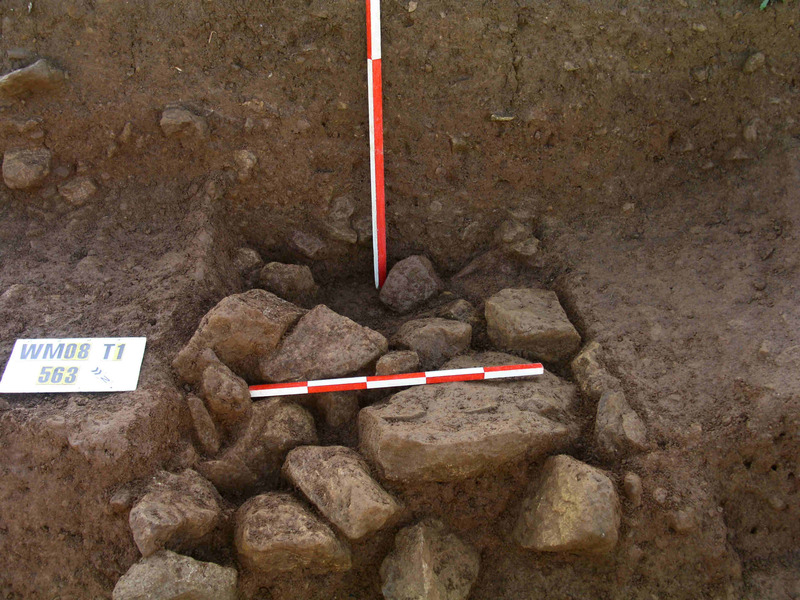 The wide spread of rubble and roof tile fragments which probably represents its demolition was cut by a post-medieval feature as well as by the long, late Roman ditch along the north east side of the site. 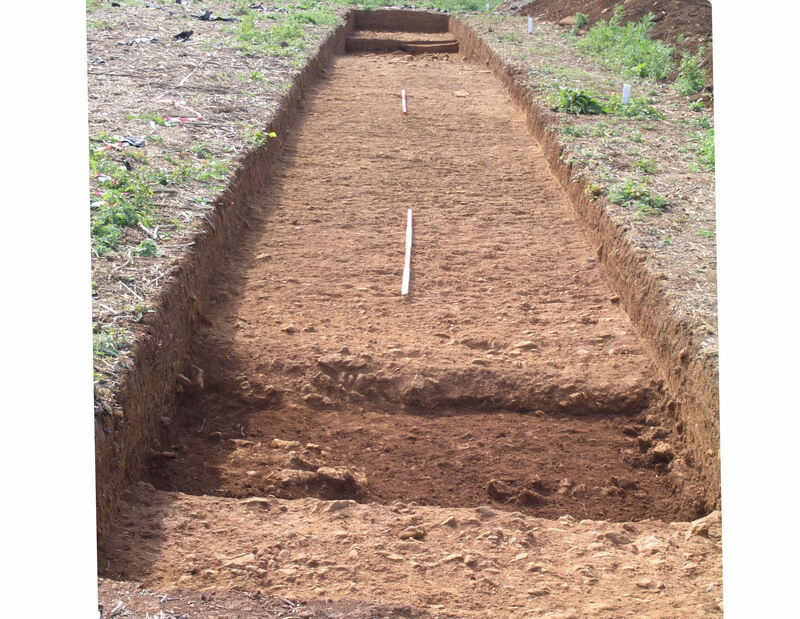 We are now speculating that this ditch and the parallel stone-filled gully in the south west extension trench might be a sort of security compound surrounding the late-Roman stone building three. An area of rubble in the centre of the site has resolved into a Roman pit, although it is unclear yet whether the north east wall of building three was constructed over it or if it’s later. Another small pit near the north end of the site has yielded some large chunks of a Roman hand-made coarse cooking pot. Some painted plaster (a dull brown, no pattern) came from the debris around the furnace in building two. Work to establish the extent of the wall of building four continues, and it is now at least 4m long, but we have no other walls to join it yet. Building two, with the furnace in it (? ), seems to have been terraced into the hillside, accounting for the reasonable preservation of its south west side and the loss of its north east side where it has been ploughed away. 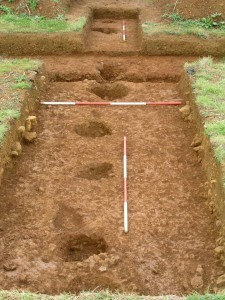 The 3 post holes aligned with the bank and ditches in Site 3 have now become 4, and another 5 post-hole-like features have appeared on the same alignment. They are not similar to the 4 previously identified as related, nor to one another. Plough damage means that we are not able to say whether the 4 related ones pre-date the bank and ditch, or were part of a revetment for the bank, or if they post-date it. The presence of the other features on the same alignment does suggest however that there was a persistent boundary here. Site 3 is now virtually finished, with just a bit to add to a section drawing. While on the subject of the bank and ditches, Richard Grove carried out the geophysical survey of the adjacent field and found that both ditches continued across it, as suspected. What was less expected was the lack of evidence for early field systems like those in the area between Site 1 and Sites 2/3, but this does support the lack of cereal in Kelly’s pollen analyses. It suggests that for some reason the area around the bank and ditches was treated differently in the iron age and Roman periods, possibly for ranching. We look forward to Kelly’s analysis of the pollen samples from Site 1, near the field system, which should retain evidence for Roman period cereal cultivation. She is also going to study samples from the neolithic burial pit-fill and the beaker period pit to see if we can extend our understanding of the environment to the earlier prehistoric periods. And while on the subject of the prehistoric burials, Bradford University specialists have done the isotope analyses and concluded that the neolithic burial contained a large adult man aged between 25 and 35 who was raised and lived locally. The cremation from the smaller ditch (one individual not 2 or 3 as we originally thought) was an adult, but not much more could be said about him or her, while the baby was less 6 months old, and was breast feeding. We await the C14 results from the Belfast lab. We expect the cremation and baby to be late iron age or Roman, but the neolithic burial could be as early as 3,500BC or as late as 1800BC; we are keen to find out. On Site 1, the removal of the temporary baulk revealed the remains of a very beaten up Roman wall, probably belonging to Building 4 for those you who can remember where this is! We still have to connect the two walls of this structure, and we hope to do this in the next week. Finds keep appearing – a large fragment of a samian bowl, fragments of fine glass, iron nails,a bone pin and lots of animal bone. The Find of the Month is a samian bowl from under the wall of Building 2. A professional geologist, Hugh Jones, kindly came and looked at the site and some samples of our stone tiles and other “foreign stones”, and he considered that most of what he saw derived from the Cotswolds rather than from Warwickshire. This switches the focus of this material to the south and west, away from the assumed hinterland of the Feldon. We are perhaps too influenced by the modern county divisions, and we may have to broaden our study of the links our site had with its surrounding territories. While we have long been aware of the site’s location in the boundary zone between the iron age tribes of Dubonni (to the south west), Catuvellauni (south – east), and Corieltauvi (north and east), used by the Romans as administrative divisions, we don’t know how permeable these boundaries were. Stone was apparently being imported from Dubonnic territory – does that mean our site was Dubonnic or merely that the Cotswolds are a more convenient source of good stone than that available in the adjacent Corieltauvi or Catuvellauni lands? It does make more sense to transport heavy goods like stone from adjacent high land using dry routes rather from sources at the bottom a very steep hill across a wet clay terrain.